Color is an extremely important aspect of design. It sets the tone of the entire space, highlighting the specific style and bringing all the design elements together. Every piece in the room should complement the wall color to create a pleasing and cohesive look throughout the space. The significance of color is not limited to style, though. Interior designers place a high value on color psychology when they fill the spaces of each residence. Each hue exudes a different mood or emotion that the homeowner seeks to highlight in a specific room. While the wall color jumps out the moment you step into a room, the various hues found inside also play an important role in properly conveying the mood. After all, in the same space there are a mix of furniture, décor, appliances and other elements that are all different colors. The combination and superimposition of these shades will generate a certain color impression and awaken certain sensations. In this way, changing the color of the walls to complement the chromatic palette of the furniture can be more effective in achieving wonderful visual effects. Combining the colors of the walls and furniture can be a tricky challenge, but it’s a rewarding project that can instantly transform a nondescript room into a beautiful living space. In this ideabook, we offer some tips and tricks that can inspire you to create combinations and play with the hues in your own home. From subdued neutrals to bold hues, each color combination will suit a particular set of furniture. Find out your perfect combo below. In a modern home, the presence of stainless steel furniture and appliances are quite common. It can be in the form of kitchen equipment, coffee tables, eclectic dressers and other elements that suit industrial-style rooms beautifully. The most common colors to combine with steel are white and gray, enhancing the and somewhat cold air of the material. However, stainless steel actually goes well with almost any color, even with ranges of warm colors, as shown in the featured kitchen above. 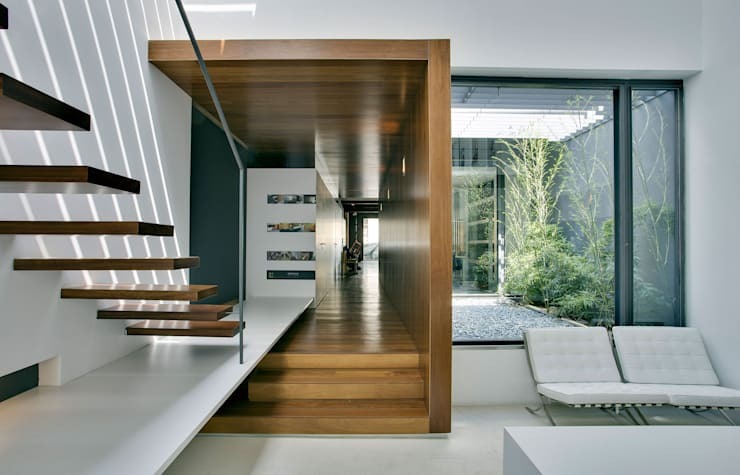 The brilliance of steel is able to put a brilliant touch to the room however dark the color of the walls is. The predominant tones in a room can encourage different sensations in us. Depending on the use of space, it will is advisable to choose a color palette. Warm colors such as yellow, brown or ocher stimulate the senses and create cozy spaces. On the other hand, cool hues like gray, blue, green and violet create an atmosphere of total relaxation and privacy, but can also give rise to a feeling of isolation that is not very welcoming for certain rooms of the house. Don’t be afraid to use different colors in the different rooms, so the functions of the various spaces can be utilized more effectively. White furniture allows us to combine it with walls of any color – it can look great with basically anything whether warm or cold tones. The color gives us the freedom to incorporate almost any color to the walls without fear of making a mistake. It brightens up the room in every occasion, although keep in mind that white-colored furnishings are more prone to dirt and stains. Try pairing it with wooden elements for a modern yet nature-inspired environment that’s tranquil and timeless. This style mixes warm and cool colors, but it also constantly plays with light tones. The shabby chic aesthetic traces its origin from the great English country houses of old. It sees the eclectic fusion of vintage pieces and more modern furniture and décor. This style uses aged looking wood, which looks great with various colors like white and even pastel hues. 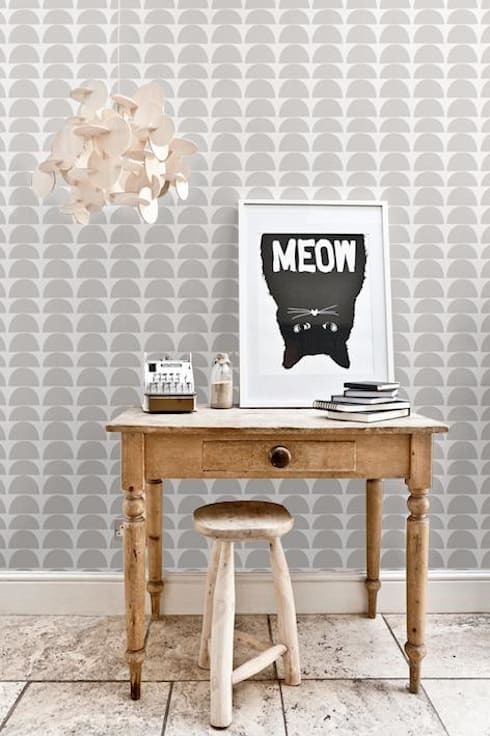 Gray walls are also commonly used, like in the featured home, which shows how a pretty wallpaper coating can give a nice texture to the wall. The original print can also add a personal touch to the room. In a room that makes liberal use of wood, warm colors are a perfect fit, especially for bedrooms and living rooms. Here, places where residents go to relax and feel comfortable, warm colors blend beautifully against the natural wooden backdrop of brown furniture and walls. Earthy hues along with white or beige are safe bets as they convey utmost comfort and coziness. Gray walls can also go well with brown furniture. 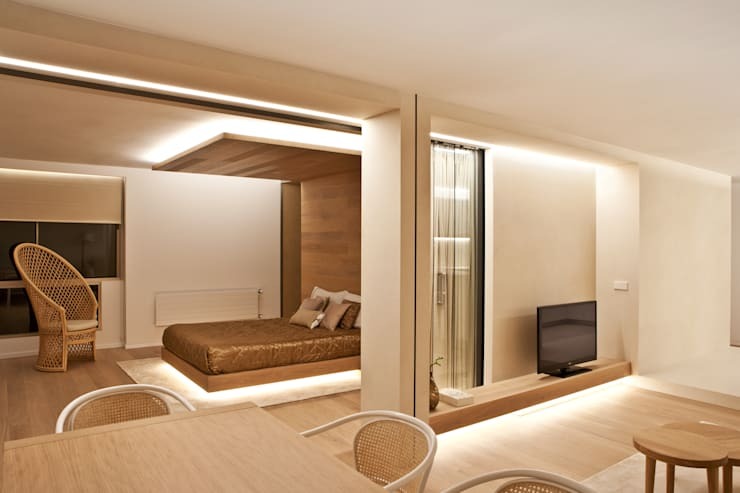 If the room is also complemented with warm lights, it creates a beautiful picture. Metal furniture is another material that often suit the industrial style. While they are not recommended for small spaces, it can add a stunning contrast to sophisticated rooms with high ceilings. With this type of furniture in a room, it is advisable to go for light wall colors for the walls. The color gray, the same chromatic range as the metal furniture, can yield spectacular effects, especially when used on only one of the walls. The rest of the walls can be painted white or light gray, creating an avante-garde touch to the interiors. 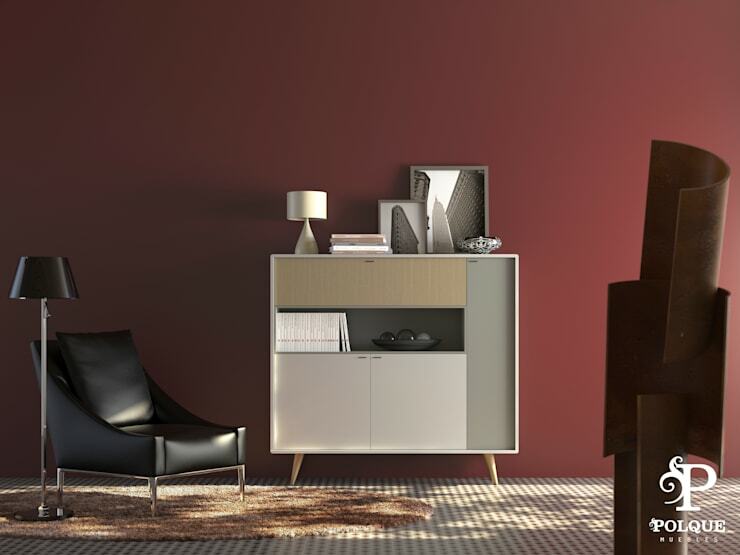 The design of the furniture and its decorative style is able to tint the impressions generated by its own colors. Furniture with pure and simple lines can be manufactured in different colors without any of them predominating over the others. Here, this Nordic-style dresser lacquered in panna, water green and oak silk suits the background colors in perfect harmony. As a backdrop for this type of simple and balanced furniture, more radical colors can be used. It can even accentuate the sophistication of the furnishings. Learn more about using color with these 21 ideas for color-blocking your home.